Less-than-perfect, NEW Giell-brand (by Rubies) White Poly/Foam Model Manikin Head with sculpted facial features - Lightweight dimensional styro body parts for cheap Halloween Haunt prop-making supply or target practice! Inexpensive holder for store shop supply for display or storing Wigs, Masks, Caps, Hats, Novelty Sun Glasses, Headphones, Scarves, Necklaces, Costume Jewelry, etc. Add make-up, paint, eyelashes, masks, hair for a more realistic-look. Can also be used for point location, acupuncture head models, safety prop dummies and student coursework. Scare your friends in your own haunted house, or spook up any Halloween event by using them as scary decorations. Styrofoam Sculpture Head can be used for arts, crafts and sewing to create realistic masks or busts. It is the size of an actual human head. 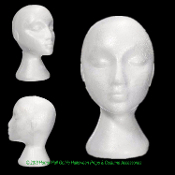 Just use any non-hardening modeling clay to form facial features on the styrofoam head, and then cover it with plaster or other mold-making material. After the plaster (or mold-making material) dries, the clay is easily removed, leaving you with a perfect negative impression of the mask to be cast. Plaster gauze may be applied and used as either a mold or as the finished bust or mask... add some glow-in-the-dark paint, drape it with robes and hang it from a tree for a nice spooky effect. *We also have headform face covers in FEMALE and MALE versions that fit either style styro heads. They're already made up with a WOMAN or MAN's dummy face for an easier way towards a more realistic look! They cover the front of the head and velcro around the neck. Just add a wig, hat or hood to complete the look! Styrofoam is useful for making severed head props for any occasion, whether you're building a prop for a short film or play, or for a Halloween trick. Because of its ease of use, you can quickly create a prop that appears as anything from a decapitated human head to an disembodied inhuman alien. Detached human head shape is a fun Halloween prop and makes an excellent addition to any haunted house or graveyard scene.